Eucerin has been a German pharmacy favourite for over 100 years! The company behind Eucerin, Beiersdorf has been associated with groundbreaking dermatological innovations and remarkable formulas since their inception in 1882. In fact, Eucerin can proudly boast that they were the first to develop a stable emollient way back in 1900 when young chemist, Issac Lifschutz filed an exciting patent for a new emulsifying agent nicknamed ‘Eucerit’ (hence Eucerin) in homage to the old Greek word for “beautiful wax”. This discovery was considered a medical revolution and paved the way for the birth of stable water-in-oil emollients that we all know and love today, an invention that sufferers of painful skin conditions are forever grateful for. Eucerin has come a long way since those early days, and now offer a comprehensive skincare range that offers treatment for everything from eczema, hyper pigmentation and anti-ageing. However, they have never strayed from their skincare philosophy of creating reliable and highly effective dermo-cosmetic products that meet the highest dermatological standards. In fact, Eucerin is the one skincare brand that requires intensive clinical testing of their products efficacy and skin tolerability before they’re willing to release it to the mass market. So when you purchase a Eucerin product you can be super confident that it’ll do your skin some good. The full Eucerin compilation contains some 59 products and 8 different categories which makes it pretty confusing to know what’s best for you. 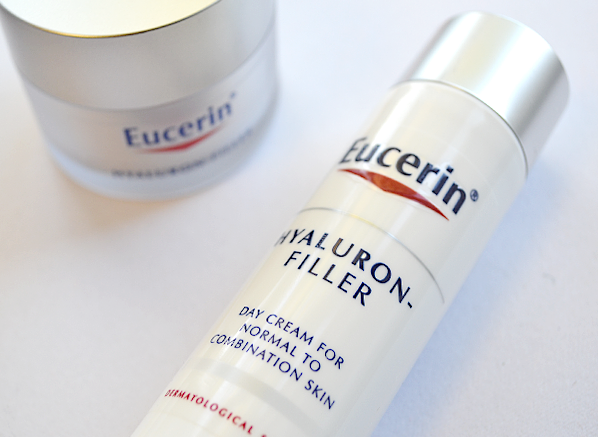 To clear up some confusion, I’ve broken down some of the different ranges in this comprehensive guide to all things Eucerin! Dry and irritated skin unfortunately affects millions of people. This painful condition frequently causes discomfort, cracked and peeling skin is usually caused by either internal or external factors, including a genetic disposition, hormonal influences, climate and UV exposure. Eucerin excels at providing effective products for dry skin conditions through their Dry Skin Urea range, an assortment of emollient creams infused with Urea, a natural moisturiser that is found in healthy skin. Urea is fantastic at binding together water molecules in the epidermis, giving it a helping hand at hanging on to and boosting its natural moisture levels, resulting in plumper, supple skin. When you apply a Urea rich emollient cream to dry skin, it gets straight to work sinking in to rehydrate and soften, whilst also pacifying skin to reduce the urge to itch which we all know is a big no-no! So what’s right for your dry skin? For treatment of flare-ups try the Eucerin Intensive Lotion 10% Cutaneous Emulsion, a targeted cream that’s safe for use all over the body. It contains a high concentration of Urea and Lactate that bind together to form a fine protective layer over skin, locking in moisture and preventing further irritation. The Eucerin Dry Skin Intensive Treatment Cream – 10% Urea is somewhat similar to the lotion, except this is better suited to flare-ups of atopic eczema, hyperkeratosis and xeroderma as it’s a tad more moisturising due to its richer emollient base. Eucerin has also got your back for day-to-day management of dry skin. 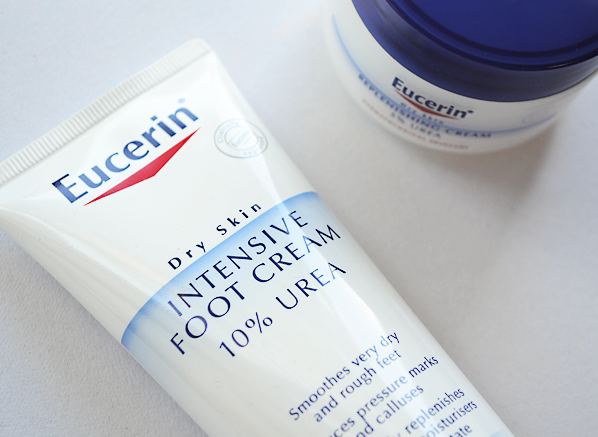 The lightweight Eucerin Dry Skin Replenishing Cream with 5% Urea can be used on the body and face to maintain skin comfort, whilst the Intensive Hand Cream and Intensive Foot Cream, both with 5% Urea ensure these hard-working limbs are protected from day-to-day aggressions. For a dry complexion the Eucerin Dry Skin Replenishing Face and Night Cream will ease discomfort, alleviate tightness and provide daily hydrating care. Then the Eucerin Even Brighter range is for you! Hyper-pigmentation is a common skin complaint, usually caused by prolonged exposure to UV sunlight, hormonal influences (think pregnancy/menopause/ageing), pollution, free radicals and other external aggressions that can result in an overproduction of melanin. This excess melanin then emerges as dark spots, age spots, freckles, uneven tone/patchiness and a general loss of radiance. To combat these emergences, the super clever skin scientists at Eucerin have developed a pioneering skincare range that dons their karate suit and fights these annoying irregularities. This clinically proven range will visibly improve pigmentation problems in only four weeks (one skin regeneration cycle), with a long-lasting efficacy that is nothing short of wonderful. The Even Brighter products have all been crafted with the efficient B-Resorcinol and Glycyrrhetinic Acid active ingredients which work in conjunction with each other for fast results. B-Resorcinol visibly reduces the appearance of dark spots for a greater uniformity of skin tone, whilst Glycyrrhetinic Acid stimulates the body to repair cells that have been damaged by age-accelerating UV sunlight for a beautifully balanced complexion. So what should you try? The Even Brighter Day Cream has been enriched with high SPF 30 protection to help prevent future pigmentation spots caused by UV rays, whilst the Even Brighter Night Cream support’s your skin’s natural regeneration overnight with a higher concentration of the active ingredients for optimum results. If you have only a few small dark spots, or want a more targeted treatment then the Even Brighter Pigment Reducing Spot Corrector would be a worthy investment. For an intensive treatment the highly concentrated vials in the Even Brighter Concentrate quickly penetrate the deep layers of the skin to further enhance the effects of the Even Brighter creams. Each vial contains enough product for a week’s use. Use daily for four weeks for visibly smoother skin and a significant reduction of pigmentation spots. It probably goes without saying, but for the very best results use all four products in combination with each other and I bet you won’t be disappointed with your new self! Being a sufferer of the eternal red-cheek myself, I really sympathise with those prone to redness. The most common reason for skin redness is stress (isn’t everything? ), climate conditions and as a by-symptom for an array of skin conditions. The Eucerin Anti-Redness range contains two star products, both infused with Liquorice Extract; a natural and incredibly soothing active ingredient with established anti-inflammatory properties that notably pacifies skin to diffuse flushing within four weeks. The non-pore clogging and fragrance-free Eucerin Anti-Redness Neutralising Day Fluid SPF 15 is a champion daily moisturiser that imparts skin with essential nourishment and hydration whilst also providing immediate, cooling relief from redness. An infusion of green pigments cleverly counteracts redness for an even-toned complexion and conceals any areas of angry looking, blotchy patches. The Anti-Redness Calming Night Cream is an incredibly soothing cream containing panthenol, a naturally sourced ingredient renowned for its ability to retain moisture and prevent dehydration whilst supporting skin’s regeneration process and reinforcing the moisture barrier during the night for a red-free face upon waking. Brilliant stuff! Blemishes, spots, pimples, zits… whatever you want to call them, they’re an unfortunate fact of life for a lot of us, teenagers and adults alike. I’m firmly in the oily-spotty skin-type category (I’ve spots on my chin that I should really start charging rent…) and have really enjoyed using the Eucerin DermoPURIFYER range. Oily/blemish prone skin needs a special kind of attention to prevent it drying out, requiring a gentle yet through cleansing routine that easily eliminates excess sebum, lifts dirt and cleanses make-up. The DermoPURIFYER range contains a complete skincare regime of cleansers, scrubs and toners that meets these requirements, whilst at the same time have all been clinically tested and are safe for use alongside specialist acne medications. The non-pore clogging DermoPURIFYER Cleanser is perhaps the most popular offering. It’s delicately balanced soap-free formula cleanses and refreshes skin in one single step thanks to its concentration of 6% Ampho-Tenside, an ingredient known for its skin tolerability and exceptional anti-bacterial and cleansing properties. Meanwhile, the DermoPURIFYER Adjunctive Hydrating Care SPF 30 is a great daily moisturising fluid for those taking acne medication as it has been created especially to combat the side-effects of irritation, dryness and dehydration that is commonly associated with Accutane and other similar medicines. A combination of natural Licorice Extract helps soothe and calm inflamed skin, Decandiol prevents any further irritation and Carnitine regulates sebum production to keep your complexion looking healthy – not too shiny, dry or red. 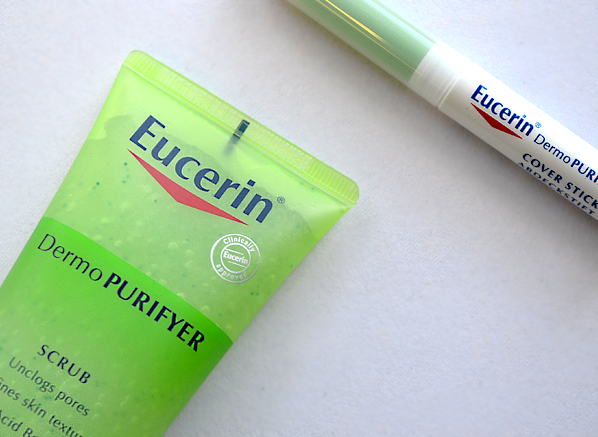 For those not on acne medications, but still dream of a hydrating, yet mattifying daily moisturiser for their oily-blemish prone skin, the Eucerin DermoPURIFYER Hydrating Care will get straight to it, refining skin’s texture to ensure a smoothed, matte and clearer complexion within just four weeks. A definite must-have – I’ve always got one on the go and another spare in my bathroom cabinet! Also available in this spot-fighting and oily-banishing assemblage are the (drum-roll please!) DermoPURIFYER Active Night Care, Toner (with 2% Lactic Acid), Active Concentrate Serum, Exfoliating Scrub (a not-to-be missed step for blemish skin types) and a Cover Stick that’s perfect for popping in your handbag and blasting pesky pimples on the go. Anti-ageing concerns are something we’ll all have to face at some point in our lives, much to our distress. The old adage of prevention is better than cure rings true when it comes to wrinkles and there’s a hefty amount of research that agrees that the best thing you can do to prevent the premature signs of ageing is to wear a good sunscreen, and you’re never too young to start! The Eucerin sun care range is extensive and has a range of excellent daily moisturising fluids with SPF30 & 50+ protection, including the Sun Fluid Mattifying Fluid for combination-oily skin and Sun Creme Face for normal to dry complexions. However, if you’ve already got some wrinkles and fine lines that you want diminished, the clinically tested Eucerin Q10 Active range is a good place to start. This compact collection contains four dynamic creams, all created with Coenzyme Q10 as an active ingredient. Q10 is a naturally occurring enzyme that improves and replenishes cell regeneration, boosting anti-oxidant reserves to help skin defend itself from harmful free radicals (pollution and UV rays I’m looking at you!) When skin’s natural stockpile of Q10 are depleted as it ages, elasticity and firmness are lost and wrinkles appear prematurely. The fragrance-free Eucerin Q10 Anti-Wrinkle Day Cream (for both dry and combination skin types) will restore skin’s quality and tone with every use, leaving the complexion and any visible wrinkles smoother and firmer with the added bonus of SPF 15. For night time the rejuvenating Q10 Active Anti-Wrinkle Night Cream will improve surface cell regeneration thanks to a dose of valuable pro-retinol whilst toughening up the epidermal barrier to prevent the formation of new lines. Lastly, the Q10 Anti-Wrinkle Eye Cream is a personal favourite of mine that’s just fab at filling in fine lines (from dehydration or age) and replenishing the thin under-eye skin with essential anti-oxidants and nourishment. A must-have in any serious beauty arsenal that’s also pretty killer at soothing under-eye circles. Optimum hydration is indispensible if you’re after radiant skin, which isn’t surprising when you consider that the body is estimated to contain about 60% water. To keep skin looking healthy and beautiful, moisture is a must which is where the Eucerin AQUAporin range comes into play! This high-tech collection has been created after years of Nobel Prize winning research and successfully supports skins own aquaporin network to provide effective moisturisation even in the deeper epidermal layers, which represents a pretty big breakthrough in the dermatological world. Aquaporins are microscopic water channels found in all cells that control the transfer of water in and out to ensure moisture is distributed in the most effective way. The remarkable AQUAporin products support and increase these networks through an infusion of Gluco-Glycerol produced by blue-green algae for controlled, intense hydration that does nothing short of transforming dehydrated skin into a luminuous shadow of its former self. Try the AQUAporin Active Light day cream for normal/combination skin, the AQUAporin Rich (with extra Hyaluronic Acid) day cream for dry skin and the AQUAporin Active Eye Cream for supple, radiant and dewy skin! And that concludes our tour through the world of Eucerin, undoubtedly one of Germany’s greatest exports (after bratwursts and beer of course!) 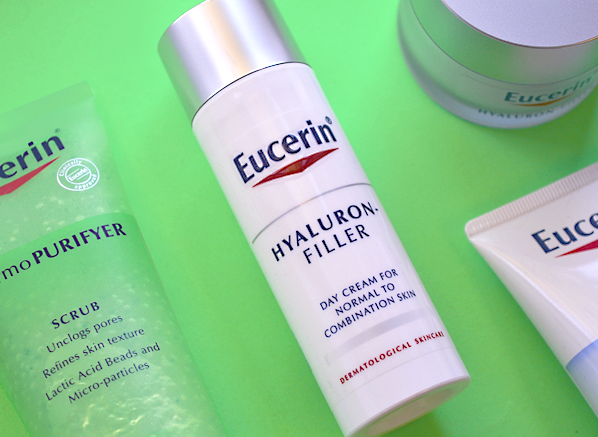 Have you ever tried anything from Eucerin? Let us know what you thought in the comments below! Shop now with 1/3rd off the entire range! This entry was posted on Friday, October 10th, 2014 at 12:24 pm and is filed under Bath & Shower, French Pharmacy, Skincare, Skincare Edit. You can follow any responses to this entry through the RSS 2.0 feed. You can skip to the end and leave a response. Pinging is currently not allowed. Thanks for getting in touch, I hope I’ll be able to answer clearly for you! Each Even Brighter product definitely works as a standalone treatment – but combining products into a four-step routine will offer an even greater level of care. Layering the four products on top of each other will give you the benefits of each product in conjunction, and as they’re designed to be used together, they won’t overload your skin. Just keep on religiously applying your SPF 50, as brightening ingredients make skin more susceptible to sunburn! That being said, it’s not essential to use all four of them to see results. Each product offers a different concentration of active ingredients. So, for example, the concentrate will have the highest concentration of B-Resorcinol and glycyrrhetinic acid, the duo that makes the Even Brighter collection so great, while the day cream offers the lowest concentration. The two products that you’re using are great – they have the highest concentration of active ingredients, and it sounds like you’re using adequate SPF, which is important when using products like these. If you have localised areas of pigmentation (sun spots), the Even Brighter corrector may be a beneficial addition to your routine – that’s another product with a high concentration of active ingredients. Otherwise, I think your routine is pretty spot on! Hi Emma thank you so much for your email. Will the concentrate actually lightens my pigmentation or only brightens my complexion? I have big patches of pigmentation that i want to lighten. To lighten them do I need to get the stick?